Impromptu dish, thrown together a few nights ago when I felt like some comfort food (and preferably with as little effort as possible). Of course, I just had to grab the fennel that the store had on offer and I think it complemented the other ingredients very nicely. I served this with polenta and rocket (aragula) and it was delicious! 1. Preheat oven to 180C. Meanwhile, heat oil in a frying pan, add the garlic & onion and saute gently until the onion starts to soften, add the fennel rings, saute another 2 - 3 minutes. Lastly add the sausages, cook for a few minutes more to lightly brown them on the outside. 2. 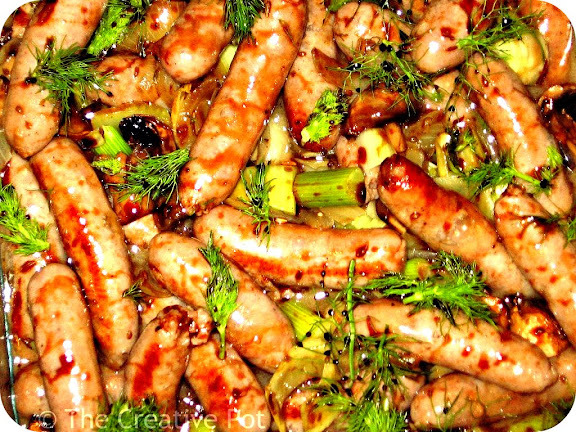 Spoon the sausages, onions & fennel into an ovenproof dish. Mix in the mushrooms and pour the white wine over. 3. Bake for about 30 minutes, then sprinkle the aniseed and balsamic reduction over and season with salt&pepper to taste. Bake for another 30 minutes, turning the sausages once to brown evenly. It is ready when the fennel is soft. 4. Serve with polenta and optionally a few rocket leaves.